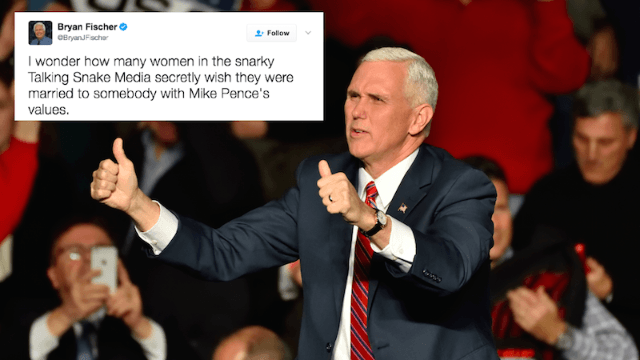 Radio host suggests women secretly want a husband like Mike Pence. The replies suggest otherwise. Much has been made this week of the fact that Vice President Mike Pence is too afraid of women to eat or drink in their presence unless he has his wife by his side. He claims it's a religious issue, but in reality, it seems more like an excuse to never hire them for positions of any importance in government. Nonetheless, arch-conservatives have rushed to defend Pence's "values." One such commentator—Bryan Fischer, former Director of Issues Analysis for the American Family Association and current host of AFA talk radio program Focal Point—even suggested that the women in media roasting Pence for his creeping misogyny secretly want to marry a guy just like him. I wonder how many women in the snarky Talking Snake Media secretly wish they were married to somebody with Mike Pence's values. Oh boy! Can't wait for all those snake-ladies to admit that he's right. If you're so afraid of yourself that you can't bear to be in the same room as women, that's not a sign of respect. That's a problem. I'm lucky to be married to a man who is a million times better than that bigot hiding behind a bible. He doesn't dine alone with women because he's too focused on the waiter. Mike Pence would fit in nicely in Saudi Arabia. He shares their outlook on women. His values ? An unwillingness to have a professional relationship over lunch with a female? That's sexist, not a defensible value! He enables a man who brags abt grabbing pu**y for God's sake, what kind of man are you to suggest Pence is a real catch? Not many. Marriage with no trust therefore no freedom is a prison. The mistaken calculation is that any significant percent of Americans wish to relive or revisit the puritanical horseshit of centuries past. @BryanJFischer Is this a trick question? HAHAHAHAHAHAHAHAHAHAHAHAHAHA... oh wait, seriously? 30 years with a guy I couldn't trust to have a lunch meeting with a colleague? Hell no! I believe the word you're looking for is not so much "values" as "paternalistic BS". Whew. With not a single supportive answer here, it seems like Fischer may have finally learned his lesson about what America really believes in.